Mom! I Want to be a Star! The ultimate showbiz “how to” guide for aspiring kids and their parents written by Hollywood Kid Talent Expert & Disney/ABC/The WB Executive Producer Irene Dreayer (Dray). As a thirty-year veteran of discovering kid stars and producing hit TV shows such as Disney Channel’s “The Suite Life on Deck”, “The Suite Life of Zack and Cody” and several TV movies, Irene Dreayer (Dray) has seen hundreds of kids try to make it in show business. Most parents and kids don’t understand the steps or how to navigate the ins and outs of the industry. Most make critical mistakes. 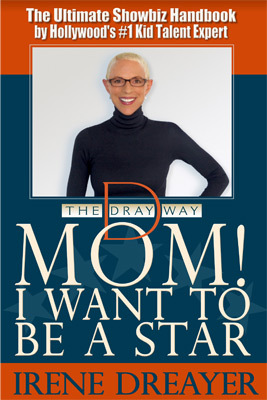 As Hollywood’s trusted career coach for kid talent, Irene Dreayer developed THE DRAY WAY www.thedrayway.com as her proven method for guiding showbiz kids and their parents on how to audition correctly, handle the business side and deal with issues such as image and rejection. The Dray Way is her method for working with kids and training parents on how to pursue this business we call show in a strategic manner, the right way. This book is designed as a workbook for parents and kids to do together. Every chapter explains, informs and delivers the honest truth about specific aspects of the entertainment business and outlines the crucial information kids and parents need to learn, as a family. Some chapters are designed exclusively for parents, but most are a family affair. The exercises in each chapter are to be completed by parents and kids in order to learn the skills required to be a better actor, singer or dancer. “Mom! I Want To Be A Star” is entertaining, fun to read and a wonderful opportunity for families to explore together their child’s dream and desire to become a star.